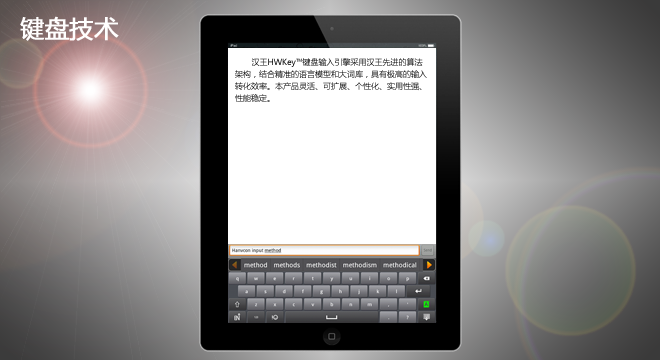 Hanvon Key™ keyboard input engine adopts Hanvon advanced algorithm framework and combines accurate linguistic models and lexicon. It has great input conversion efficiency. The product is flexible,extensible, personalized, Practical and reliable. 1.support multilingual recognition, support over 30 foreign languages,including simple, complex, English, Japanese, Korean etc. 2.support large character set recognition, support GB18030、BIG5、HKSCS etc. 3.support prediction, word-completion etc. It is easy and fast for users to input. 7. Support platforms :android、IOS、Windows、Linux、MTK、Windows Phone etc. 9.high code security level, no open source code, be available for industries with higher security level such as car-carried devices, bank etc.